A visitation will be held from 1 to 2 p.m. Saturday, June 16th at O'Leary Funeral Services in Norwalk with a Celebration of Life Service beginning at 2 p.m. A reception will follow at Lilly's home in Norwalk following the service. To leave a condolence and order flowers, using O'Leary's Flowers in Norwalk, click the "send tributes/flowers" tab above or call (515)-981-0700. Auria Lorene Franco, daughter of Dan and Brooke Franco, was born on April 29, 2018 in Berwyn, Illinois. She was a loving baby; she was very much a mother’s daughter. 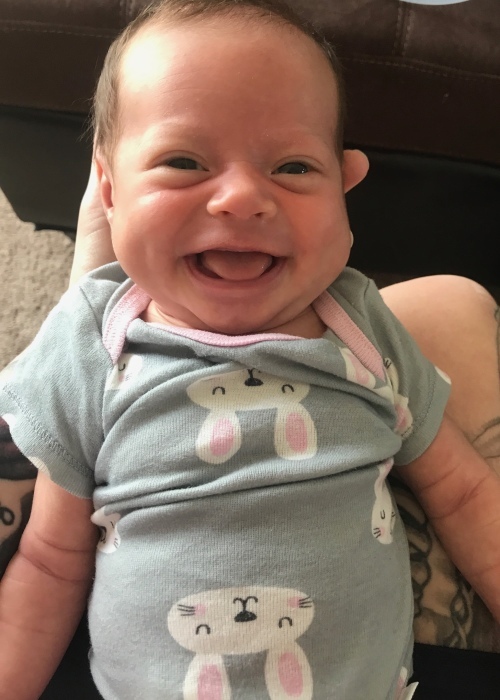 Auria was always smiling and wiggling around. Her bright and cheerful nature could be felt by everyone. She loved showers and peeing on dad. She liked to be swaddled in warm fuzzy blankets, and be held very close and tight. Auria would only sleep if she was with her mother. Dad got plenty of baby time as well, often Auria would try to suckle dad’s nose. Auria also enjoyed spending time with her grandparents, she loved them very much. Auria was her grandfather’s, Apolinar, favorite granddaughter and truly feels the weight of this loss. Tragically, on June 13, 2018 Dan and Brooke’s little peanut, Auria, decided to pack her things and leave early. Auria is preceded in death by her great-grandpa, George Vincent Baker; and her great-grandparents Howard Pete and Helen Neva Olesen. Auria is survived by her parents; her grandparents Michelle and Olie Olesen, Lilly and Tony Weisshaar, and Apolinar Franco.